The 16th annual Kamehameha Schools Hawaiʻi Hōʻike will share the Hawaiian opera, The Battle of Kuamoʻo on March 14 and 15. THE BATTLE OF KUAMOʻO, an opera sung entirely in the Hawaiian language, tells the story of the fateful conflict after the death of King Kamehameha (in 1819) between Kona chief Kekuaokalani, loyal to the traditional customs and religion, and Liholiho, the new king swayed by his regent mother to end the old ways to make way for the new. Through music, traditional dance and chant, the story is retold of the fate of an island nation shaped by a single battle. Purchase $5 pre-sale tickets in person via our high school office after school (2:30 p.m. - 3:30 p.m.) on school days through 3/13. Funds raised from the Hōʻike performances will help to defray travel costs for students traveling to perform this Hawaiian opera at the world's largest performing arts festival in Scotland, the Edinburgh Festival Fringe. Your support will help them represent Hawaiian language, culture and moʻolelo on an incredible worldwide stage. Questions? Call (808) 982-0680 or email kshawaii@ksbe.edu. The unifying work of the high school surrounding the preparation of this year’s Hō‘ike epitomizes the pride and aloha of the high school in embracing the legacy and mission set forth by our Ke Ali‘i Bernice Pauahi Bishop. Following Hōʻike, students will be performing the final section of the opera along with the Kamuela Philharmonic Orchestra on Sunday, March 24 at the Kahilu Theatre. The KPO will be premiering a new symphonic suite of the opera, which will be the backing music when students travel to Scotland. Visit www.kamuelaphil.org for more details and to purchase tickets. Additional shows are scheduled for April 24 at the ʻImiloa Astronomy Center and on June 15 at the University of Hawaiʻi at Hilo. More details will be announced as those shows near. Read more about the show and where students plan to take this significant moʻolelo. Hō‘ike 2014 dramatizes the moments that lead to the final battle for the Kingdom of Hawaiʻi.The story begins months after Kamehameha the Greatʻs death and follows the power struggle between Kamehameha II, Liholiho, and the keeper of the war god, Kekuaokalani. After Liholiho—on the advice of Ka‘ahumanu— decides not to reinstate the ʻai kapu, which in essence strikes down the ancient religious system, Kekuaokalani, the defender of the the ancient gods, rises up in rebellion against Liholiho. The result is the battle of Kuamoʻo, the war between the traditional and the modern. At the center of this is Manono, Kekuaokalaniʻs wife, whose dedication and love drives her husband forward in his defense of the ancient religion. In the end both die performing the greatest sacrifice a human can for his or her culture.Battle of Kuamoʻo will be reprised for Kamehameha Schools Hawai'i Hōʻike 2019 on March 14 and 15, and then travel to Scotland in August for several performances at the Edinburgh Festival Fringe, the world's largest performing arts festival. Junior Kalaninui Wilson and sophomore Ewalea Dameg join Loeka in the KWXX studio to share more about Hōʻike 2019. 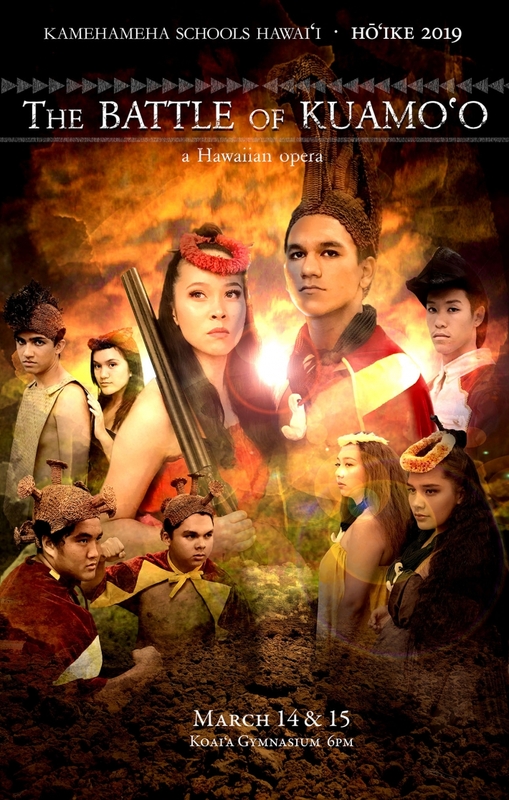 Kula Kiʻekiʻe will reprise Kamehameha Schools Hawaiʻi’s second Hawaiian opera, The Battle of Kuamoʻo, for Hōʻike 2019 and the Edinburgh Festival Fringe in Scotland.